The idyllic Bahamas are world famous for their amazing shark diving. Top on the list of the best dive sites in the Bahamas are Tiger Beach, named for its resident Tiger Shark population, and the Bimini Islands when in the months of January through March you can reliably encounter Great Hammerheads! 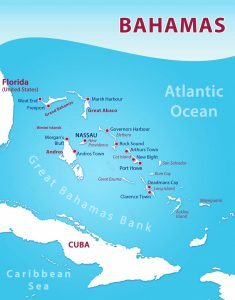 Our 10 night liveaboard trip on Bahamas Master has been specifically timed to coincide with Great Hammerhead season and will take us to both Tiger Beach and the Bimini Islands! As well as close up encounters with Tiger Sharks and Great Hammerheads, the trip also promises encounters with other shark species, including Lemon Sharks, Nurse Sharks, Caribbean Reef Sharks and Bull Sharks! Tiger Beach is located off the West End of Grand Bahama Island and is the best known point for Tiger Shark, Bull Shark, Caribbean Reef Shark and Lemon Shark encounters on a shallow, white sandy bottom. This is the ultimate site for close up big shark encounters! A Great Hammerhead Shark (nicknamed Patches!) also often makes an appearance in the months of January through March. The westernmost island group of the Bahamas, these are truly ‘islands in the stream’ as they are situated southwest of Grand Bahama Island on the edge of an underwater cliff that drops hundreds of metres into the blue abyss. The Bimini Islands are the most famous spot for Great Hammerhead and Nurse Shark encounters. You will normally also find Bull Sharks at the Bimini Islands. The best time to encounter Great Hammerheads at Bimini is January through March. Bahamas Master is a 35m steel vessel with 8 well designed cabins that can comfortably accommodate 16 divers. There are two Deluxe cabins on the forward upper deck, with double beds and ensuite bathrooms, two Premier twin cabins with ensuite bathrooms and four Standard twin cabins sharing two bathrooms. All cabins have panoramic windows, so there is plenty of day light and ocean view for all. Communal relaxation areas are both on the upper and main deck. On the main deck towards the bow of the boat, you will find the indoor lounge with comfortable seats and sofas and a TV/DVD. Upstairs, you will find the spacious covered outdoor bar and dining area, as well as a sundeck for relaxation after the dives. Dive equipment is set up and stored at the rear of the main deck. All guests are allocated an individual set up location, with under bench storage for masks, fins and other personal items. A central camera set up table can be used to store prepared equipment ahead of the dive, with dedicated rinse tanks provided. There are 4 spaces available on this trip. The cost of the trip is 4,100 USD in a Standard cabin with shared bathroom, 4,500 USD in a Premier cabin or 4,800 USD in a Deluxe cabin. These prices include 10 nights on Bahamas Master, all diving, tanks/weights/weight belts, all meals, snacks, fresh coffee, tea, soft drinks and juices. Flights are not included in the price, but can be readily arranged by Equator Diving upon request. Trip prices in GBP and EURO are also available upon request. All of our holidays come with 100% Financial Protection via our membership in the Travel Trust Association (TTA No. U8813). Our holidays that include a flight departing from the UK are also financially protected by our Air Travel Organiser's Licence (ATOL No. T7471). Equator Diving Ltd is company No. 07502867 registered at 34 Bramley Road, Bramhall, Cheshire, SK7 2DP.